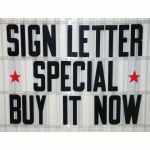 Flex Letters for Portable Signs, Flashing Arrow Signs, and Custom Signs and Reader Boards. Our Flex-Change Letter sets are screen printed on flexible 030 mil (about the thickness of a credit card) UV protected plastic. 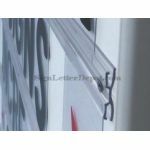 Bend or flex letter to insert into the portable sign flex letter track. Flex-Change plastic letters are for Signs that use 030 Flex Letter Track also called "Texas Track". 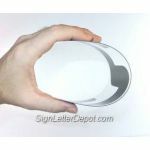 Refer to catagory "Sign Letter Track" to determine the type of track to match your signs changeable letters. Note: This type letteris not recomended for signs that have enclosure doors. Copyright © 2009-2016 Sign Letter Depot, LLC. You may not, copy, download, publish or distribute any content including written content descriptions images except with our express written permission.